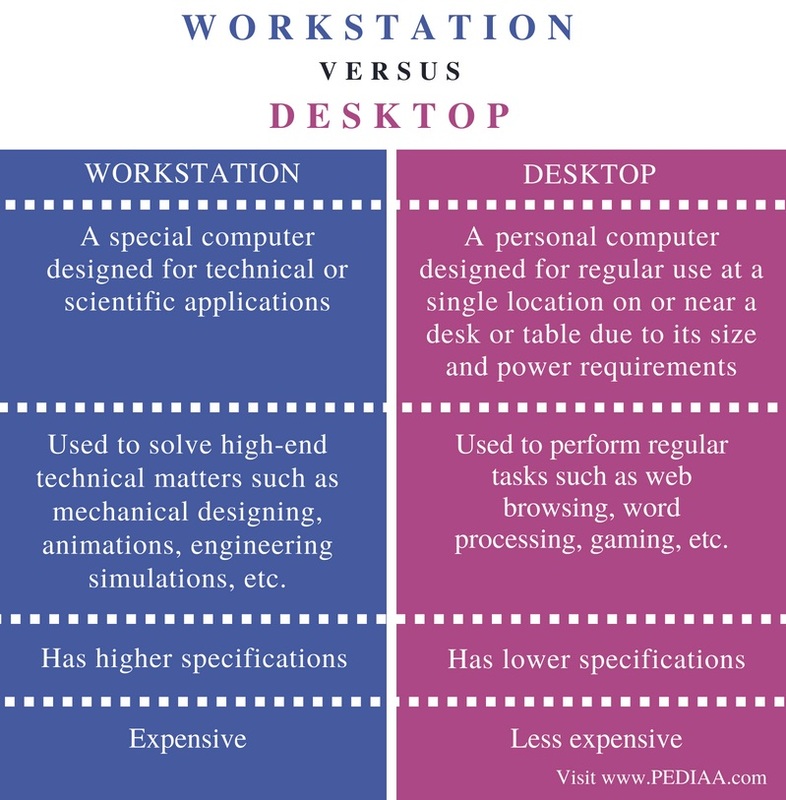 The main difference between workstation and desktop is that the workstation is a special computer designed for technical or scientific applications while the desktop is a personal computer designed for regular use. A computer is an electronic device that performs arithmetic and logical operations according to the instructions of the computer programs. These programs can perform various tasks. Workstation and desktop are two types of computers. A workstation is a high-end computer that is mainly used for scientific or any other heavy usage application. On the other hand, a desktop is a computer that can be used to perform regular tasks. It is possible to identify whether the computer is a workstation or a desktop depending on the installed components. A workstation is a special computer that is designed for a technical or a scientific application. Sometimes, desktops are not applicable to working environments. Therefore, computers with better specifications are called workstations are used. A workstation can refer to a mainframe computer terminal or a PC connected to a network. 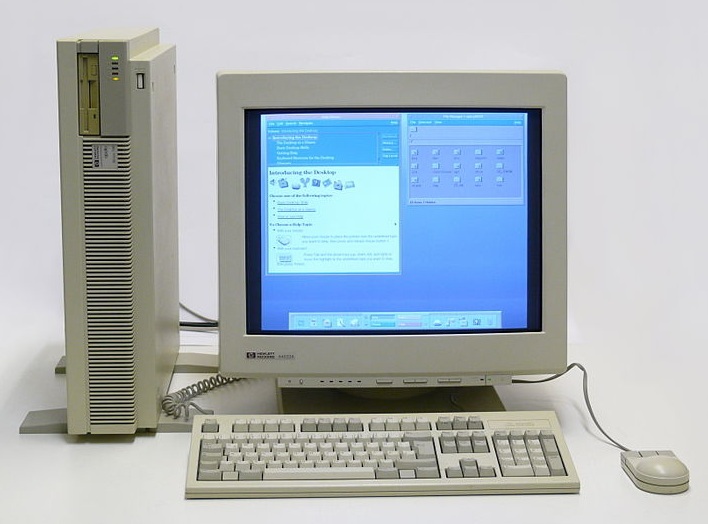 It can also refer to a collection of hardware offered by organizations such as Silicon Graphics, Apollo computer, HP, DEC, IBM, etc. A workstation can consist of multiple displays and more input devices other than a mouse or keyboard. It can also contain high quality speakers, programmable keyboards and controllers. It contains the CPU, graphics, high memory capacity and multi-tasking capability. Therefore, a workstation provides high performance than a usual personal computer. Workstation is used for many applications. It is used for handling complex data such as in 3D mechanical design, animations, image rendering, and mathematical plots and in various engineering-based simulations. Overall, a workstation provides advanced accessories and collaboration tools. A desktop computer is a personal computer used to handle daily tasks by individual users. It is used for tasks such as word processing, web browsing, gaming, accessing audio files, video files, etc. It has a power supply and a printed circuit with a microprocessor. It works as the Central Processing Unit. There are a memory bus and disk storage such as hard drive and optical disc. It has a mouse and a keyboard as input devices. The monitor and speakers are the output devices. A workstation is a special computer designed for technical or scientific applications. A desktop computer is a personal computer designed for regular use at a single location on or near a desk or table due to its size and power requirements. The main use of a workstation is to solve high-end technical matters such as mechanical designing, animations, engineering simulations, etc whereas, a desktop performs regular tasks such as web browsing, word processing, gaming, etc. A workstation has higher specifications than a desktop. Concerning the cost, a workstation is expensive than a desktop. 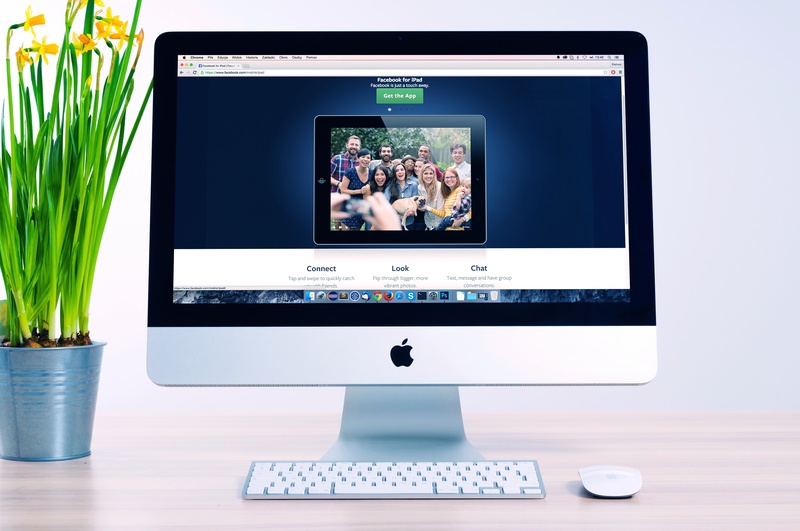 The terms workstation and desktop are used interchangeably, but they have a difference. The main difference between workstation and desktop is that a workstation is a special computer designed for technical or scientific applications while a desktop is a personal computer designed for regular usage. 1. “Workstation.” Wikipedia, Wikimedia Foundation, 22 Aug. 2018, Available here. 2. “Desktop Computer.” Wikipedia, Wikimedia Foundation, 24 Aug. 2018, Available here.